At a General Council Meeting on Tuesday night at Ealing Town Hall, Rosie Ivison of Avenue Crescent (in the Mill Hill Park conservation area) made an impassioned speech to the gathered ranks of councillors about the controversial plans to impose speed humps which have vexed residents for many months. At the meeting, Ms Ivison listed the long sequence of events which started this year. 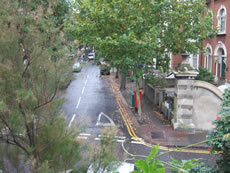 Residents were first consulted about the proposal for traffic calming during the Christmas/New Year period 2006/7. Their objections led to two meetings when it was agreed that because of objections to the visual intrusion, pollution and noise caused by speed humps, there would be no speed humps throughout the Mill Hill Park Conservation Area. However, it was decided that there would be some simple traffic calming devices in the conservation area such as rumble strips and additional parking bays. Subsequently residents were again roused to fury by further public consultation questionnaires in April which they felt were badly-worded and misleading. The local Residents' Association committee decided that a simple message would be more effective. They produced a written statement against the speed humps but in favour of traffic calming generally which was signed by around 250 people living within Avenue Gardens/Crescent/Road and Heathfield and Mill Hill Roads. Leana Pooley, who heads the Mill Hill Park Residents' Association, was amazed to receive a proposal from Ealing Council last week which suggested two options, both including speed humps or 'raised tables'. Ms Ivison berated the council for not listening to its own residents over the plans, which form a part of the Bollo Road traffic calming scheme, but also praised them for agreeing to residents' parking, the chicane by Langley Drive and the Victorian-style lampposts. Coincidentally, at the same meeting, two women from Northholt, submitting a petition to the Mayor before the Mill Hill Park residents took to the floor, were desperate to have speed humps in their streets. Rosie told the assembled councillors: "Two charming women from Northholt have just told me that they are desperate for speed humps. Please give them the ones we don't want". 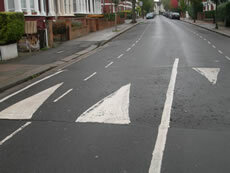 When asked about Ealing Council's policy on speed humps for the Mill Hill Park Conservation area, Councillor Vlod Barchuk said there would be no speed humps in the Mill Hill Park Conservation Area and that in Mill Hill Road there would be some cobble strip, a raised speed table at its junction with Gunnersbury Lane and some additional parking bays. Representing the Mill Hill residents, Rosie Ivison asked that this should be confirmed in writing. However, since the meeting Leana Pooley received yet another communication from the Head of Transport at Ealing Council asking her to discuss with local residents whether they would like three raised speed tables in Avenue Road at junctions with Ave Crescent, Ave Gdns & Heathfield Road. Local Councillor John Gallagher has replied on her behalf that "the residents made their opinions very clear at the Council meeting". No doubt there will be a mountain of protest if the humps scheme refuses to subside.